Monitoring your job site’s true ambient conditions just got a whole lot easier . . . Whether you are renovating a home or building a hospital, monitoring ambient temperature and humidity conditions at your project can help you avoid costly and time-consuming damage as well as expensive call backs later. The only way to be sure service conditions remain is constant observation and recording. The Wagner Meters Smart Logger™ monitor and the Smart Logger™ app are your eyes on the job site 24 hours a day. Obtain consistent documentation of service conditions and reduce your liability. Remind your customers to maintain optimal conditions at the project area. Boost your credibility with customers who see your use of the latest technology. Get another touch point with your customers as you return to retrieve the Smart Logger™ monitor. Provide a visible reminder to the general contractor and workers to maintain service conditions. Maintain your great reputation with general contractors by using the latest technology to ensure successful outcomes. With Wagner Meters’ Smart Logger™ monitor and Smart Logger™ app. These sophisticated tools utilize the latest Bluetooth® technology and other advanced technology to collect and store data. Once back at the job site, use the Smart Logger™ app on your Bluetooth® mobile device to collect, store, and track temperature and humidity. Leave the monitor at the job site to collect ambient temperature and humidity conditions. Next, set parameters on the free Smart Logger™ app downloaded to your Android or iOS device. Then take off . . .
Gone for one or more days? No problem. The monitor collects ambient conditions the entire time you’re away. 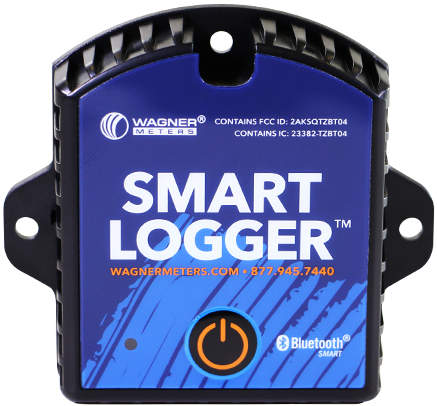 Buy the Smart Logger™ now at the Wagner Meters store. You can easily and conveniently order online or give us a call worldwide toll-free at 1-800-634-9961. We’re here to help Monday to Friday, 7:30 am to 4:00 pm Pacific Time. Download the free Smart Logger™ app at the Apple Store or Google Play. Click the Smart Logger™ manual button for more information. Questions? Ask our experts at 1-800-634-9961.